Mister Rogers arrives with a cardboard box with a hole cut into its side to look like a television screen. In the kitchen, he adds a two bottle caps to serve as control knobs and uses two balls and handkerchiefs to make some simple puppets. 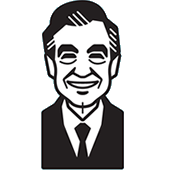 With everything together, Mister Rogers makes his own pretend television program. Outside, Mr. McFeely shows Mister Rogers an angora goat named William. Mr. McFeely dispells the myth that goats will eat anything. Mister Rogers gives William some carrots before Mr. McFeely departs with a gift for Mister Rogers -- a shoebox that Mrs. McFeely has decorated to look like the Neighborhood Trolley. In the Neighborhood of Make-Believe, Queen Sara and Lady Aberlin are talking about the garbage crisis as they wait for King Friday's television appearance on The Universe Today. Old Goat and New Goat are at Someplace Else checking out the garbage as Neighbor Aber explains to Lady Aberlin that goats do not eat garbage. At Someplace Else, Old Goat and New Goat are talking to Harriett Elizabeth Cow and Donkey Hodie about the composition of their garbage. The goats ask to fax their associates back in Northwood with this information as they, along with Lady Aberlin and Neighbor Aber, head towards the castle in search of a fax machine. Mayor Maggie is at the castle as Neighbor Aber and Lady Aberlin return. Queen Sara brings out a fax machine and shows Lady Aberlin how to fax the goats' document. As they await a response, everyone tunes into The Universe Today as they watch Patrice interview Lady Elaine Fairchilde and King Friday about the garbage crisis. A call to the show from Sue Goat as well as a return fax to the castle reveals that the goats from Northwood will help with the garbage crisis by recycling. Hilda Dingleboarder arrives on the set of The Universe Today with her new invention -- a machine that turns pieces of garbage into something useful. Back at the house, Mister Rogers talks about the importance of asking for help as it is often very close by. He concludes by singing I'm Proud of You. A short time after Mr. McFeely arrives with William the goat, William "makes a small mess" as Mr. McFeely talks with Mister Rogers. As Queen Sara demonstrates the fax machine, we learn that the "Northwood speed dial redial" number is 37. Queen Sara also mentions that she frequently uses the fax machine for Food for the World. The second of three callers to The Universe Today is a bass violinist named Joe whose comment is directed at King Friday: "I just wanted to tell King Friday that he's one cool dude." This episode is featured on the 1994 VHS release Our Earth: Clean and Green.